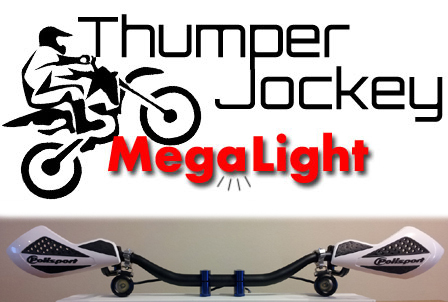 The best off road LED light for motorcycles is by far the ThumperJockey MegaLight. They're designed as dirt bike lighting so they are built tough enough to handle the most extreme conditions. The best components are assembled to offer a solid performing dirt bike light. The MegaLight is more than twice as bright as a stock head light in most applications and only consumes about a fourth of the power. It's designed to fit most motorcycles, even if your dirt bike doesn't come with lights. A battery pack is offered for dirt bikes that don't have electric start such as any motocross bikes. Handlebar mounts and wire harnesses are also available to easily get you connected to the best dirt bike lighting available. There's no reason to stop riding your dirt bike on the trails after dark. With these phenomenal LED lights you can keep on riding.